Have you seen this video yet? Parents punk kids with bad holiday gifts! - I Am Proud Of My Kids! Have you seen this video yet? Parents punk kids with bad holiday gifts! For sure, the looks on these kids’ faces is priceless and it’s hard not to laugh. But is this funny, mean – or both? Would you punk your kid with a gag holiday gift and post a videotape of their reaction online? Be the first to comment on "Have you seen this video yet? 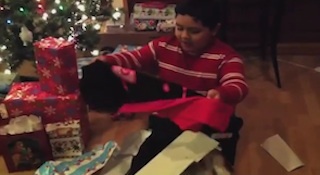 Parents punk kids with bad holiday gifts!"